The red grape probably comes from France. There are around 120 synonyms that indicate old age. Some of them alphabetically grouped by country are Augustclevner, Augustklevner, Augustiner, Augusttraube, Blauer Augustiner, Blue Frühburgunder, Frauentagtraube, Frauentraube, Frühblaue, Former Burgundy, Frühschwarze, Jakobstraube, Juliustraube, Möhrchen, Schwarzer Frühzeitiger Burgunder ( Germany and / or Austria ); Jacobstraube ( Alsace ); Black Inly, Early Black Cluster, July Grape England ); Ischia, Madeleine Noir, Maurillon Hâtif, Morillon Noir Hâtif, Morillon Parisien, Petit Morillon Hâtif, Pinot Hâtif de Rilly, Pinot Madeleine, Pinot Noir Précoce, Pinot Précoce, Pinot Précoce Noir, Raisin de la Madeleine, Vigne d'Ischia ( France ); Luglienga Nera, Luviana Veronese, Maddalena Nera, Uva de Trivolte ( Italy ); Blue Early Burgundy ( Switzerland ); Burgundy Modré Rane ( Slovakia. Czech Republic ); Juliusi Szölö, Korai Kék Kisburgundi, Szent Anna Szölö ( Hungary ). It is about a mutation of Pinot Noir; she is one of them Pinot varieties (see there in detail). The name refers to the about two weeks earlier maturity compared to the parent variety, which is called in this context significantly German Spätburgunder. It may, despite seemingly suggestive synonyms or morphological Similarities do not match the precocious varieties Abouriou (Jacob Straube) Franc Noir de la Haute-Saône or St. Laurent (Laurenziustraube) be confused. From a seedling was in 1845 the Madeleine Royale bred. The openly dimmed seedling Muscat Précoce de Saumur turned up as an intersection Muscat Blanc out. The vine was also crossing partner of the new breeds Helfensteiner. Mairam and Volta, In 2005 she was accepted as a "passenger" of the "Ark of Taste". It belongs to the group of Slow Food excellent foodstuffs that are protected / endangered by industrial agriculture and the food industry. Under her synonyms she was z. B. 1690 (Morillon Noir Hâtif) and 1762 (Madeleine Noir), under Pinot Noir Précoce by Ampelographen Giuseppe di Rovasenda (1824-1913) but only mentioned in 1877. 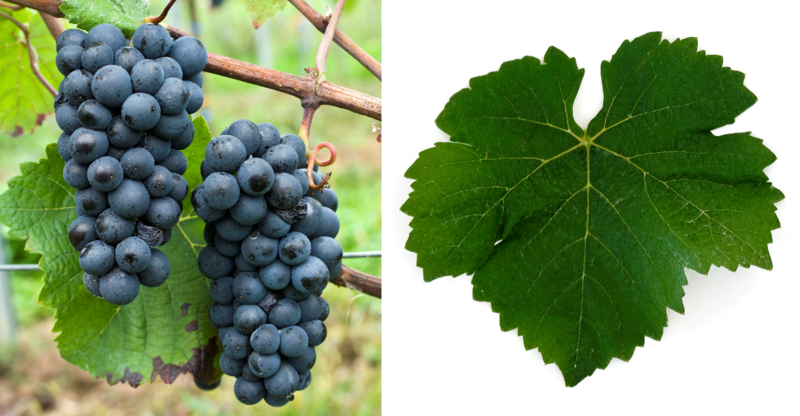 The very early maturing, low-yielding vine is prone to Verrieseln, but due to the thick-skinned berries resistant to Botrytis, It produces ruby red, extract rich, fruity red wines with aromas of cherries and blackberries, but compared to Spätburgunder / Pinot Noir less storage potential. In the German growing area Ahr the early burgundy was still one of the most frequently cultivated varieties at the beginning of the 20th century. Low yields, tendency to trickle and attack by virus led to the fact that in the 1960s, with a stock of only 15 hectares, the variety was almost extinct. In the mid-1970s, she was then from the research institute Geisenheim revived by being resilient Clones were selected and built. In 2009, it already occupied 256 hectares of vineyards in Germany, mostly in the three growing areas Ahr. palatinate and Rheinhessen, Small stocks are also available in Austria, in the Switzerland and in England (19 ha). In 2010, a total of 275 hectares were recorded (Kym Anderson ). This page was last modified at 30 March 2019 at 16:33.